Radio is one of the most powerful mediums in the United States, with a weekly reach of over 90 percent among adults. There are over 11,000 radio stations in the U.S., all competing for a piece of this massive market. WTOP, a station operating out of Washington D.C. is the largest of its kind in the U.S., pulling in almost 68 million U.S. dollars in yearly revenue. Online radio is also playing an increasing role in the radio market, with an estimated 61 percent of the U.S. population listening to online radio in 2017. A name not usually associated with radio, Apple, has also forged out a place for itself in the industry, with over 40 percent of all digital radio listening taking place on its iOS operating system. American radio stations generated a total revenue of almost 15 billion U.S. dollars in 2017, of which 890 million dollars was generated through online radio streaming. In addition to the massive national stations and broadcasts, local public radio stations also appear to be thriving. Public radio station revenue has increased from around 624 million U.S. dollars in 2009 to over 830 million in 2016. ‘Country’ is by far the most popular format, with 2,137 individual stations broadcasting music from this genre. 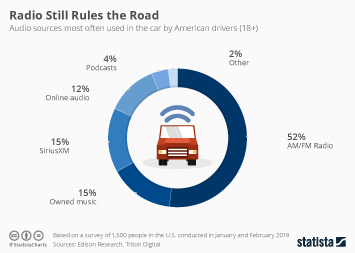 As of 2018, Americans averaged 106 minutes of radio listening time per day, with much of this time being spent while commuting. The continuous presence of advertising on radio, heard in cars as well as in public areas, is an incentive for many businesses to invest in this medium of advertising. Some of the leading investors in radio advertising are T-Mobile, the Comcast Corporation, Home Depot, and AT&T. In 2017 alone, T-Mobile spent 188 million U.S. dollars on radio advertising, while Comcast splashed out another 185 million.